Loose-leaf Links is a feature where I gather together the interesting bits and pieces on sci-fi, fantasy and romance I’ve come across and share them with you over tea. Today’s tea is Australian Grapefruit from Adore Tea. 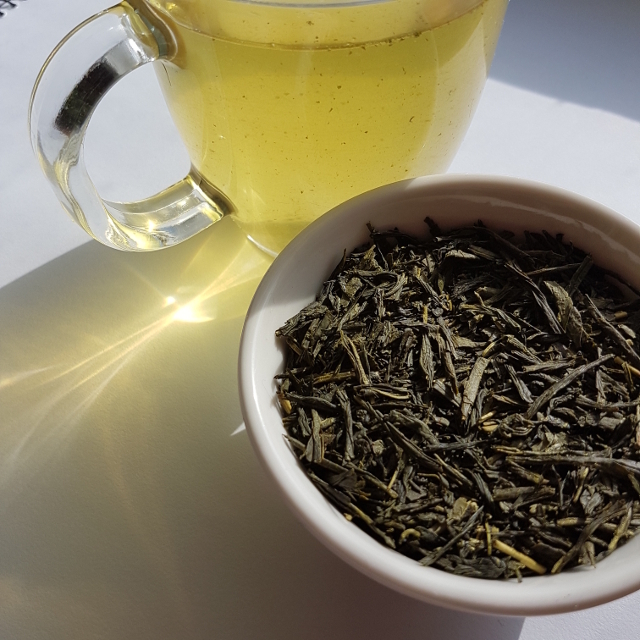 It tastes like a plain sencha at first, but finishes with a strong citrus aftertaste. The winners of the Nebula Awards were announced last weekend. The awards are voted on by active members of the Science Fiction Writers of America. And it seems there’s no rest for the wicked because their suggested reading list for next year’s award is already up and being added to. The shortlists for the 2017 Locus Awards have also been released. The awards are voted on by readers of Locus, with the winners to be announced in June. Another change has been made to the ballot for the Hugo Award, with Mansik Yang declaring himself ineligible for Best Fan Artist. Meanwhile, the voting packet for the Hugo Award has been released and it is impressively extensive, as File 770 details. If you’d like to get your hands on the full ten books of Seanan McGuire’s Toby Daye series or the entirety of the graphic novel nominees, you can still purchase a supporting membership for Worldcon 75 and receive the voting packet up until voting closes on 15 July. A reminder that the 2017 World Fantasy Awards are open for nominations until 1 June. This year’s judges include Nalo Hopkinson and Juliet Marillier. The program for Continuum 13 has now been released and is crammed full of great panels. Continuum is Australia’s Natcon for 2017 and will take place in Melbourne from Friday 9 June until Monday 12 June. In November, Debbie Notkin resigned from the Tiptree Award committee to concentrate her energy on other things. She recently posted a farewell message. Silvia Moreno-Garcia is establishing a new Emerging Indigenous Voices Award. The impetus behind this award came from a recent controversy in Canadian literature in which a tone-deaf editor suggested the establishment of an Appropriation Prize for the best portrayal of a character not remotely like the author. Moreno-Garcia wasn’t the only one outraged and crowdfunding for her Indigenous Voices Award has reached over $91,000 CAD at the time of writing, with two months still to go before the campaign closes. She also suggests other means of supporting Indigenous creators. Diversity in romance may have suffered a setback after news broke that Harlequin plans to close several imprints. This includes their Kimani line which focuses on POC authors. Gillian Polack has pieced together a brief list of Australian Jewish SFF authors who use Jewish themes in their work. Hopefully, it might grow a bit longer in the future. Breaking the Glass Slipper takes a look at gender parity in PR from publishing houses. Uncanny Magazine are open to short story submissions for a brief period 3-10 June. Max. word count 6K. Rocket Stack Rank takes a look at whether a story’s length (within its category) affects its chances of winning a Hugo or a Nebula Award. Delilah S. Dawson shares some advice on first chapters. Thanks to Ysabet MacFarlane for the link. Kat Clay discusses why she converted from pantsing to plotting. Gillian Polack is currently pondering a new alternate history setting. Patreon supporters may get to witness and discuss the process, which may be useful for authors looking to contribute or create their own setting. Tiny Owl Workshop has announced the line-up for the third round of short stories for its Lane of Unusual Traders. Book View Cafe are bringing out an anthology called Nevertheless, She Persisted, edited by Mindy Klasky. Judging from the authors, it’s going to be an interesting anthology! Tansy Rayner Roberts and Rivqa Rafael have teamed up with Twelfth Planet Press for a new anthology called Mother of Invention. Themed around AI built by women and non-binary creators, the anthology will be crowdfunding in June. They also have an impressive line-up already and will be opening for further submissions once crowdfunding is complete. Readers should beware of Amazon’s changed Buy box: the book you’re buying may not be as new as you expect. Over on Book Riot, Jessica Woodbury discusses her relationship with the Goodreads Reading Challenge Tracker. I know I’ve been there.